The Acteal massacre that prompted Chris Treter to get into coffee is a horrific story that continues to reverberate. Matt Earley, a friend and colleague of Chris, wrote about the struggle for peaceful existence through coffee. Chris and Matt also feature in a documentary film, Connected by Coffee. More about Higher Grounds coffee, including the latest news from Congo. Cooperative Coffees also shares some interesting stories on its website. A couple of cool additional listens: Episode 4 of Alexis Madrigal’s series on Containers is all about The Hidden Side of Coffee. 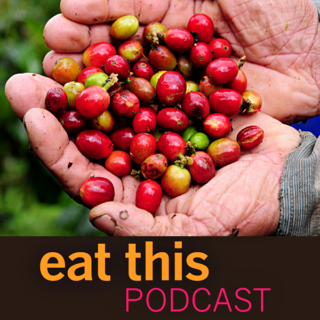 And the podcast Start-Up recently told the story of probably the world’s most expensive coffee, at $16 a cup. It’s easy to fall into despair faced with details of how the foods we enjoy are produced, which almost inevitably involve the kind of power imbalance that makes exploitation and maltreatment not only possible but, apparently, inevitable, not only far away in former colonies but much closer to home. In Europe and in America, producers and consumers are thinking about third-party certification for local growers. What more could be done? Banner and cover photos of coffee cherries in Colombia by Neil Palmer (CIAT). Elina Kanellopoulou liked this note on facebook.com. Lindsay Naylor mentioned this note on twitter.com. Lindsay Naylor liked this note on twitter.com. Jennifer Wilkin Penick liked this note on facebook.com. Higher Grounds liked this note on twitter.com. If you really want to do good by spending more on your coffee, you need to look beyond Fair Trade and other certification schemes.